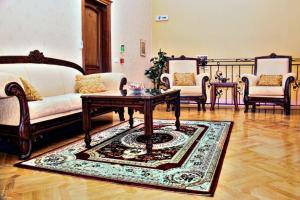 Premier Hotel is conveniently located in the popular Baku area. The hotel has everything you need for a comfortable stay. To be found at the hotel are 24-hour front desk, room service, airport transfer, meeting facilities, car hire. Each guestroom is elegantly furnished and equipped with handy amenities. Take a break from a long day and make use of sauna, indoor pool, massage. Premier Hotel is an excellent choice from which to explore Baku or to simply relax and rejuvenate.